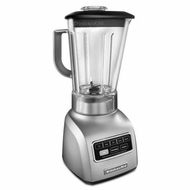 The 650 Series KitchenAid blender features a .9HP motor, powerful enough to handle your household blending tasks from stirring dry ingredients or chopping walnuts all the way to liquefying fruits and vegetables for smoothies and juices. The 650 Series Kitchen Aid Blender has a patented stainless steel blade to ensure that your blender will outperform and outlast other blenders in its class. The Blend & Serve Pitcher allows you to enjoy your blended product quicker, easier, and smoother than before. With the 5 Automatic settings for Stir, Chop, Mix, Puree, and Liquefy you can rest assured that your Kitchen Aid Blender will provide the proper consistency for every recipe.